Christmas can be a stressful time for our furry friends; full of daunting new experiences and tempting dangerous items. This must-read list will help you avoid the vet and the upset over the holidays. Everyone’s day-to-day routine is turned on its head at Christmas, which is one of the things to love about the holidays, but not so for your pet. Any change to the usual schedule for feeding, sleeping and exercise may cause your pet to become anxious, which aside from being unpleasant can lead to illness. It can be all too easy to forget to pay enough attention to our beloved pets among the hustle and bustle. Consider your pet’s welfare when making plans for the holidays, and try as much as possible to withhold their routine. It is shocking to consider that almost all Christmas decorations are potentially hazardous to our pets. Whether it’s poisonous holly, mistletoe or poinsettia, or ornaments and lights that are choking and electrocution hazards if bitten. Even tinsel can cause intestinal blockage if ingested, which will require surgery to remedy. All these things are shiny, pretty, new, and look like toys to our cats and dogs, so we can’t blame them for being intrigued by them. It is up to us to ensure that all dangerous items are kept out of their reach. As we allow ourselves to overindulge on all the tastiest things we can imagine, it’s natural to want to share that joy with our pets. However, it is of critical importance to remember - what is a treat to us is not necessarily a treat to them, and may cause them serious harm. For example, chocolate is one of many foods that is fatally poisonous to dogs. In fact, giving them any food they’re not used to can upset their entire digestive system leading to serious conditions such as haemorrhaging gastroenteritis. If you think you might be tempted to give them something new and tasty over the holidays, be prepared and visit your local supplier of pet food to get them some healthy snacks. If you have a real tree, regularly sweep up fallen pine needles to prevent them from sticking into paws or being ingested. 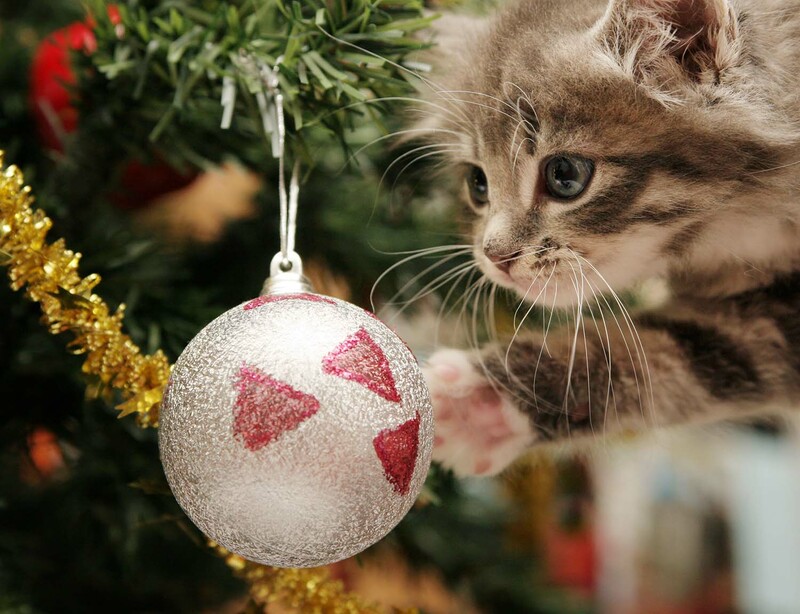 Make sure your tree is stable and poses no risk of falling on your pet. As well as a sturdy stand, you may need to use some fishing wire and a ceiling hook to secure it from the top too. If possible, fence it off also so it is out of their reach. Many pets who are reported lost during the festive season, escape during parties or large get-togethers in the home. Freezing temperatures are just one of many reasons why this is a very worrying occurrence at this time of year, so take precautions if you’re hosting. Your pet may be happier in an unoccupied room than being forced to mingle with all those strangers anyway! If your dog or cat is gifted a toy this Christmas, read its label and make sure it is completely safe for them. An ordinary child’s toy will pose many dangers for an animal. Lastly, enjoy your holidays with your best friend!